Guys, I hope you’re excited. We are to the point in this journey where we begin to encounter Disney’s most classic works. 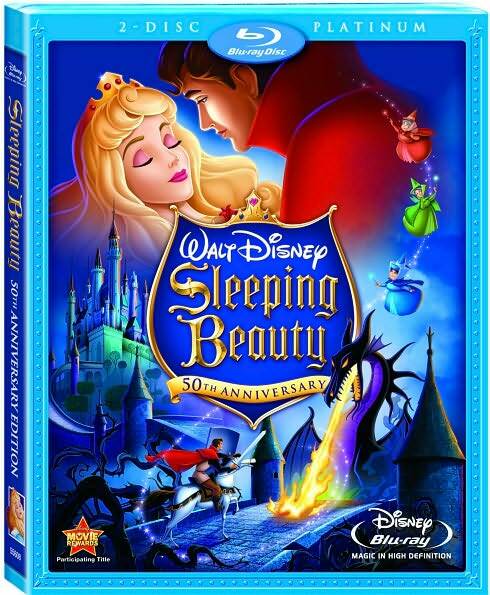 This review covers one of the best animated films ever, Sleeping Beauty, and, as we continue, we will be watching pictures such as Snow White and the Seven Dwarfs, Cinderella, Pinocchio and many other great equally great movies. On the other side, we are leaving behind Disney’s modern treasures. Sadly, there will be no more Beauty and the Beast, Aladdin or The Lion King to look forward to. But, that doesn’t mean there are no good films left. On the contrary, the second part of this review will cover The Hunchback of Notre Dame (which is nearly on par with some of those aforementioned modern treasures) while future reviews will include fun films like Tarzan, The Emperor’s New Groove and The Princess and the Frog. Those are all good films to which I am very much looking forward. So, like I said, I hope you’re excited, because I sure am. This stretch run will be really, really fun. Okay, on to the reviews! 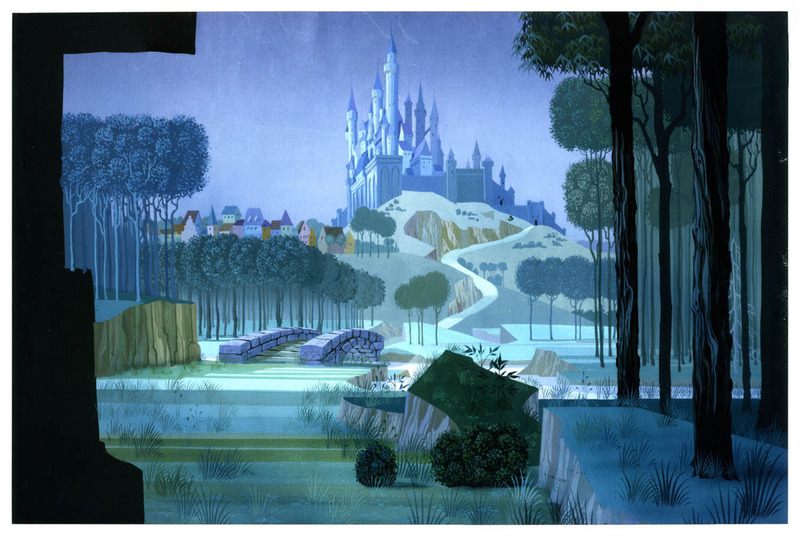 Sleeping Beauty inspires beautiful artwork. Alright, so Sleeping Beauty!! What to say, what to say?? Basically, it’s just one of Disney’s most classic and iconic films. No big deal. Strangely, I didn’t remember anything about the film before Hayley, Venny, Brazle and I sat down to watch it, which can only mean I probably never saw it growing up. Crazy!! I was probably too busy playing Super Mario Kart. At any rate, it was really cool getting to watch it as an adult, and I really liked it. It’s definitely not the perfect movie, but it is very fun. Maleficent is a fantastic villain, the music is wonderful, and most of all, the artwork is incredible. Actually, I would say that the main reason to see the movie is the artwork. I mean, the story is good, but really, who hasn’t seen a movie about a princess falling asleep? I mean, really? And the characters are fun, but other than Maleficent, none of them are treeeeemendously memorable. And the music – it’s good, but there are lots of Disney movies with good music. So that leaves the artwork. 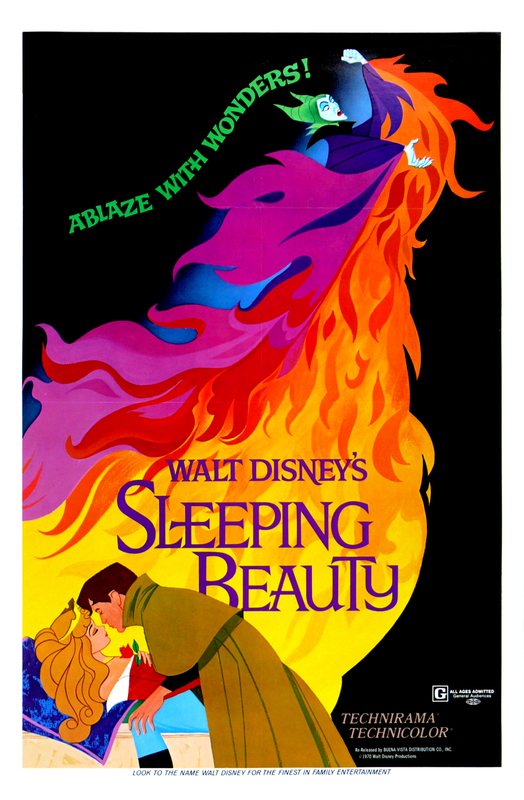 None of the movies we’ve watched yet have artwork quite as good as that of Sleeping Beauty. So put that in your pipe and smoke it. In all, I would give this an 8.2/10 with the main reason for watching being the artwork followed by the music. Aurora has many animal friends. It’s a timeless fairy tale originally crafted by Charles Perrault as La Belle au bois dormant, or, “The Beauty sleeping in the wood”. It would’ve been funny if they’d kept the original name, in French. Imagine some guy with a twang: “Hey kids, let’s go watch ‘La Belly A Boo Is Door Mant’.” At least, I think it would’ve been funny. Remember how The Black Cauldron nearly ended Disney’s animation studio? Well, thirty years earlier, it was Sleeping Beauty that nearly broke the Mouse Guys. Yeah, it was a box office bomb. Can you believe it? As such, it was never re-released during Walt’s life, and it lead to the company-wide decision to never release another “princess” movie. But since Walt’s passing, it has been re-released several times, going on to become a very successful picture. And as for princess movies, well, have you heard of The Little Mermaid, Aladdin, The Princess and the Frog or Tangled? The primary reason the film was a “bomb” wasn’t necessarily that audiences stayed away; rather, the reason was that it was so expensive to produce. At the time, it was the most costly animated production in Disney’s history. The Boss Man demanded extremely detailed artwork, and since xeroxing wasn’t ready for full use, the entirety of Sleeping Beauty was hand inked. Too bad the artwork was like a hundred million billion times more intricate than previous films and thus required over 500 artists just to bring it to completion. That’s why later films, starting with 101 Dalmatians, primarily used xeroxing to transfer drawings to celluloid (xeroxing allows for much smaller crews – read more here). Sleeping Beauty is intricately detailed. If you want to see this on your shelf, you’ll need help from Jackson and Grant. The movie features wonderful music adapted from Tchaikovsky’s original ballet program. What the heck, Tchaikovsky????? He’s the guy that did the Nutcracker Ballet, in case you’re wondering. And if you’re wondering what the Nutcracker Ballet is, well, my deepest sympathies. Anyway, I feel like Tchaikovsky’s involvement is really random. And awesome. His music is superb, making SB another one of a long line of Disney movies with wonderful scores. If nothing else, you can almost always count on Disney to have great tunes. The blu-ray is selling for $70-80 right now. Frowny face. If you’re still wondering if you should watch Sleeping Beauty again after all these years, then let me welcome you to my last point. Chances are that, unless you caught it in the theaters, or unless you’ve watched it in the last 8-10 years on your widescreen at home, you have never seen this thing in widescreen. So, you should ABSOLUTELY watch it again if only to catch it in all its widescreen brilliance. You’ll be glad you did. The artwork in Sleeping Beauty is breathtaking. So, in closing, Sleeping Beauty is the classic movie that nearly shut down Disney. It has a good story, fun characters (especially Maleficent) and great music. And most of all, absolutely superb artwork. I give it an 8.2/10 and highly recommend it to any audience. The Hunchback of Notre Dame is a good movie. 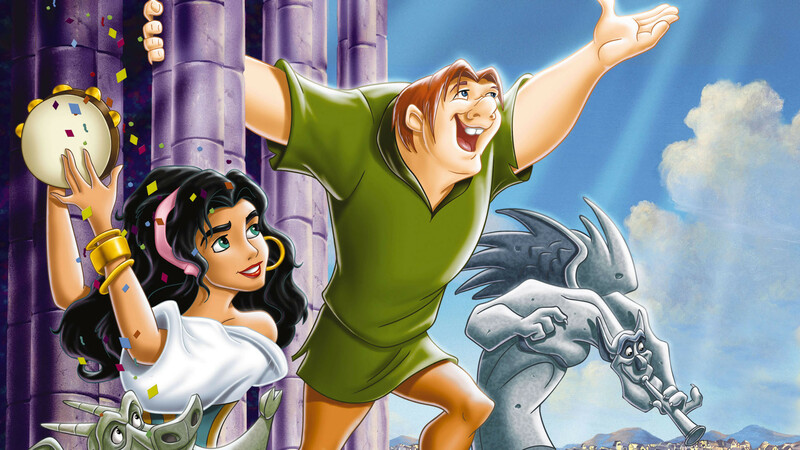 Unlike Sleeping Beauty, The Hunchback of Notre Dame didn’t nearly cause Disney’s animated demise, so it’s not quite as cool. Nevertheless, it’s still a good movie. Based on Victor Hugo’s novel of the same name, this picture brings to life the classic story of Quasimodo (the deformed bell ringer of Notre Dame) and his struggle to escape his suffocating confines and become a part of society. It is one of Disney’s darker films (certainly the darkest of the 90’s), but that darkness is balanced quite nicely with comedic moments and great musical numbers. In all, though the movie never quite attains the complete brilliance of other films released earlier in the Disney Renaissance, it comes close. Very close indeed. 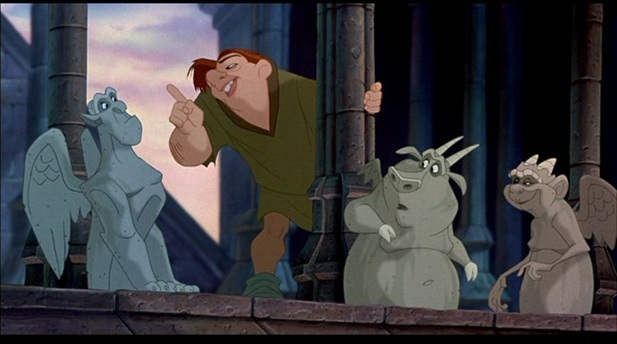 If I were to name the two things that make The Hunchback of Notre Dame great, I would say they are the story and music. I give this film a 7.9/10, and I declare it fit for any audience. Story: This story makes me think more than any of the films we’ve watched yet. It isn’t just another romantic story of people finding their true love and living happily ever after. Instead, Hunchback deals with some very real issues. For example, the protagonist is someone who never changes to become physically beautiful. Quasimodo must grow to accept and see value in himself. Also, we are shown moments of introspection from the selfish antagonist including some that are realllllllly really creepy. In those moments, we are reminded of just how warped some folks can become. 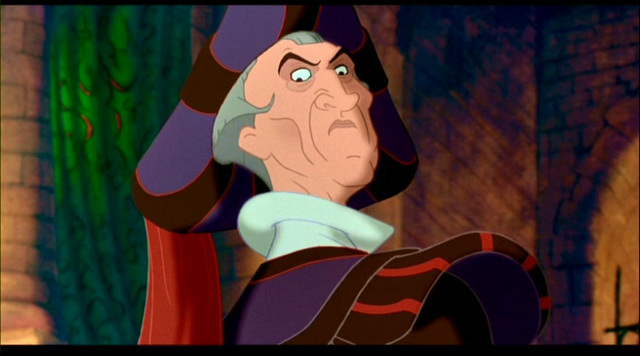 On the whole, Judge Frollo is pretty “out there”. Now, those are just a sample of some of the more grown-up subjects dealt with in the film; when you watch for yourself, you will likely recognize many other topics than the ones I’ve mentioned here. The point is, this movie really does address issues Disney doesn’t address in other animated films. The moral dilemmas presented are what define the story, but the structure is also very pleasing. The production team did a nice job of establishing plot devices early in the film, only to see them come into play much later. I love that kind of thing. One of my favorite authors is Rafael Sabatini, and he frequently sets up plot elements early in his stories, only to bring them back at crucial moments. Even if you know an important detail will come into play, it is still exciting to see just when, where and how that will happen. If you like that in your stories, you will likely appreciate The Hunchback of Notre Dame. Before leaving the subject of story, I must address the gargoyles. Named Victor, Hugo and LaVerne, they are the comedic relief of the movie, and they’re great. Merits noting. Quasimodo and Esmerelda are good singers. Music: The music in The Hunchback of Notre Dame is pretty incredible. Composed by Alan Menken with lyrics from Stephen Schwartz, the collection of songs is dynamite. Some of the numbers are bizarre and whimsical (“Topsy Turvy”) while others are very serious and plot-centric (“The Bells of Notre Dame”). Others are used to reveal crucial character elements (‘Out There” and “Hellfire”) while others simply serve to increase the joy quotient for such a deep movie (“A Guy Like You”). All of those songs are extremely enjoyable and entertaining, and they provide nice, different textures through which we observe the proceedings. There is one more song I didn’t list above, and it’s my favorite: “God Help the Outcasts”. Quasimodo is friends with three comedic concrete gargoyles. “God Help the Outcasts” is sung by Esmerelda when she’s in the chapel, dis-traught over the treatment of Quasimodo and the gypsies. It’s breathtaking. It carries a wonder-fully compassionate message I would like to always carry with me, basically that everyone has value. I was surprised to find Esmerelda singing it to Jesus Christ, for I don’t recall many overtly Christian themes throughout Disney’s animated canon. I suppose there is Friar Tuck in Robin Hood. Come to think of it, there aren’t any overtly religious themes of any kind in any of Disney’s films, so this is a pretty unique song. Overall, this movie is loaded with great songs – if you like what Disney did with The Little Mermaid, Beauty and the Beast or The Lion King, you will like this music. 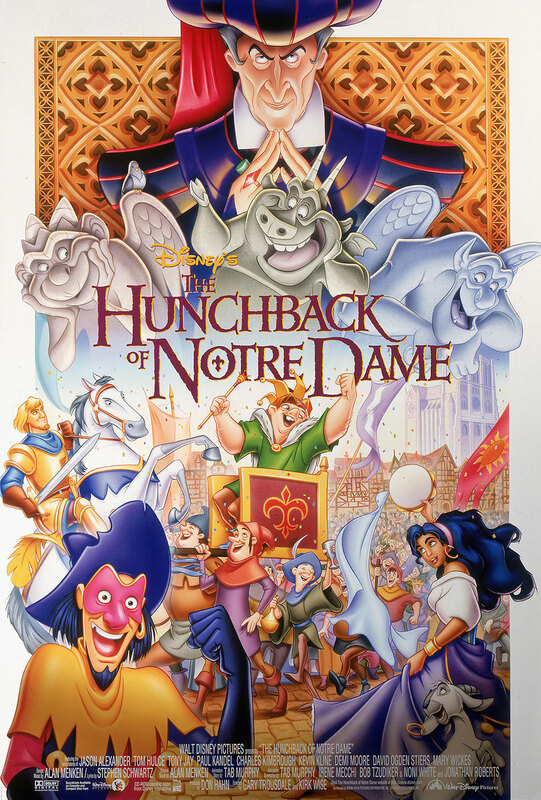 In closing, The Hunchback of Notre Dame is one of Disney’s most serious and grown-up animated films. Though it fails to reach the heights of earlier films in the Disney Renaissance, it still manages to be one of Disney’s best films due to a great story and wonderful music. I give it a 7.9/10 and recommend it to any audience. IMPORTANT PS: I just thought of this – regarding the audience for Hunchback, it seems to me that the film will especially appeal to those who loved another darker Disney movie with great songs: Beauty and the Beast. So, if you liked that movie, you definitely need to check out Hunchback. If not, then…..still watch, but take your expectations down a notch. Grant Stevens is a freelance writer from Texas but Oklahoma. He likes all kinds of movies and recently began a journey through ALL of Disney’s traditionally-animated features. Check the sidebar to your right to check out earlier reviews, and subscribe to be notified each time Grant posts another review. Also, check out Grant’s music endeavors at www.grantstevensgroup.com. I’M glad you loved the artwork as much as I did. When I first saw this movie, i was pacing around my house while holding my head in disbelief. I think what truly makes this even more impressive than Avatar is that the artwork and detail still holds up after 50 YEARS. We are still mind blown, 50 years later. Even with all of these pixar releases, this still towers above them all….simply an incredible feat. the artwork is beyond masterpiece status…it’s revolutionary. The only artwork that comes near this film is Tarzan and its’ deep canvas set up. We’ll have to wait and see it’s blu ray transfer this summer.